Gmail does a lot of things for us. After all, it’s the largest email service in the world. So it’s gotta be doing something right, right? We use Gmail at Don’t Panic, and I have many personal accounts with Gmail as well (yay for inbox forwarding!). I have a personal email address, an address for our household accounts (RE: bills) and spammy things, and my personal blog contact address also forwards through Gmail. I am logged into at least five Gmail accounts every single day. That’s a lot of use! On the personal side of things, I never got so much email that I couldn’t handle it by using the built in folders and tagging features that Gmail offers. But once I started working online, things changed. I was getting tons of email daily and I couldn’t keep up. I could never find the one message that I needed to accomplish that one task. I was spending more time searching for the message than I was completing the task that I needed the information for. So, I started researching. Since then, which was about six months ago, I’ve probably tried two dozen different plug-ins and lab features until I finally found a few golden eggs among all the rotten ones. To make it easy on you (and so that you don’t have to go through six months of trial and error like I did), I’ve compiled my favorites in this one handy spot. This is my very favorite feature within Google Labs. You’ll have to get to it through your settings panel. Just log in to your Gmail account and click on that cute little gear button in the top right corner of your inbox. Once you’re there, go to settings. In settings, go the Advanced tab and enable the Multiple Inboxes feature. Refresh and you’ll have a tab for Multiple Inboxes waiting for you. 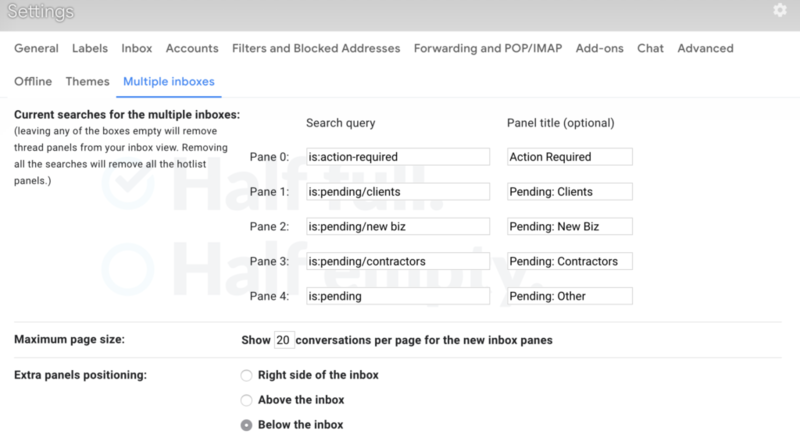 You can set your inboxes to anything you’d like, but I use keywords like “action required”, “pending”, “schedule”, etc. This Chrome plug-in does it all. It schedules your meetings, lets you create and plug in canned responses, allws you to insert surveys or polls right into your message body, tracks who has read your messages, lets you schedule messages to send at a later date, and allows you to set sequences of messages to be delivered over the course of whatever timeframe you set. They even allow you to brand your schedule options and surveys with your assets. MixMax has been a key element of our sales funnel process! To implement this plug-in, go to the website and install the Chrome extension (Sorry IE, Firefox, and Safari users! ), then you’ll have a few settings to adjust to suit your needs and you’re off to the races. This is a paid subscription tool, but it’s so very worth it. This tool is a plug-in available for Chrome, Firefox, and Safari (yay!). All you need to do is install from the website and give Boomerang your authorization to run. It allows you to schedule email to be sent at a later date and clear your inbox by telling an email to go away for a little while. Boomerang is probably the best thing that’s ever happened to me. You see, I’m a new mom and I live on the West Coast. That’s two strikes against me when it comes to trying to schedule normal working hours. There are times when I am literally not able to get any work done during the day and end up staying up until midnight getting things finished. But then I inevitably need to send an email, either internally or to a client. Receiving an email that’s time-stamped for midnight, though, is a bit unorthodox (and my boss usually yells at me for being up so late working). As a workaround, I would have drafts upon drafts to send out each morning. Only, morning for me is actually 10:30 a.m. on the East Coast. I’ve lost so many valuable email hours by that point! With Boomerang, I write the emails and schedule them to go out first thing in the morning EST and have responses waiting for me when I roll out of bed! Another great feature of Boomerang is its ability to actually fling something out of your inbox completely when you’re drowning in email. It’ll come back in a few days, hopefully when you’re more prepared to deal with it! This one’s just for fun, but visuals often play a big part in my ability to be productive! I’ve changed the backgrounds of all of my inboxes to reflect what I’m doing when I’m in them. For example, my Don’t Panic inbox background is light blue with our logo in the bottom left corner. It’s not too distracting by having text on top of text, but it’s still clearly visible that I’m in Don’t Panic mode! To change your image, go back to your gear icon (like we did with Multiple Inboxes). This time, instead of clicking Settings, click Themes. Scroll down to custom themes and choose either light or dark custom theme. Once you choose, you’ll see a link appear that says “change your background image”. Click on that and upload your image. Easy peasy! Do you have any really great Gmail hacks to add to my list? Please let me know in the comments or on twitter @jennbizzle. Because let’s face it, at this point, I’m a hack addict.